Guidance on E-Discovery: The Road to CEIC 2013: Orlando, We are Here to Stay! The Road to CEIC 2013: Orlando, We are Here to Stay! After our fabulous Tuesday, we all had an extra half hour of sleep this morning, the final day of CEIC. Breakfast was sponsored by H11 and Cellebrite; and at 7:40 AM, the Early Birds were already enjoying the sun and great weather outside. At the last moment, I was asked to speak at Quality Control Perspectives in EnCase® eDiscovery with Aaron Bennett, field engineer, and Joe Pizzo, senior solutions consultant. We hosted an interactive discussion on the different aspects of quality control in EnCase® eDiscovery; with handon configuration of EnCase® eDiscovery desktop, and the Legal Hold and Examiner Configuration/Management web interfaces. My final session for CEIC 2013 was Shaking up the Security Stack: The Future of EnCase® Cybersecurity, with Anthony Di Bello, senior manager of strategic alliances, Joe Pizzo, senior solutions consultant, and Jason Fredrickson, senior director of enterprise applications. After framing the current problems in cybersecurity, they reiterated Victor Limongelli’s Welcome Keynote theme: The good guys need to work together. Automation intelligence about threats to the endpoint is required to keep pace with the increasing cyber-threats. No single point solution can solve the problem; and best-of-breed integration and interoperability is the key to building a security automation architecture around incident response. They explored how EnCase Cybersecurity currently integrates with FireEye, Q1 Radar, SourceFire and ArcSight; to automate host visibility and control for: immediate validation of compromise, instant impact assessment, determining the scope of the breach and the ability to remediate the threat. The generic Enterprise Service Bus (ESB) allows you to integrate with your preferred tool, including the upcoming EnCase® Analytics. They also challenged attendees to pressure their security vendors to provide an open framework to operate with other companies. As the sessions ended, the hallways filled with attendees shaking hands; exchanging cards, hugs and fist-bumps; bumping Smartphones and saying their goodbyes until next year. As promised, CEIC continues to be the biggest digital-investigations conference of its kind and the only one to offer so many hands-on lab sessions for practical skills development. There’s simply no other conference or seminar series available that packs so much relevant and practical information from so many expert speakers into a single four-day period. 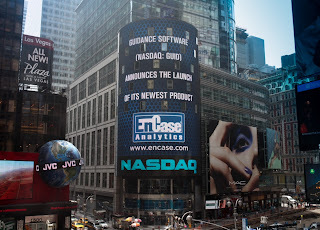 Although you heard it first at CEIC, now the entire world knows about EnCase Analystics. As you say “See you later” to Orlando, don’t forget Guidance Software is here to stay! At CEIC 2013, we announced the opening of a new training facility to serve the southeastern United States. I will see you at @CEIC_Conf 2014, hosted at Caesars Palace in Las Vegas, 19-22 May 2014!